At Coach John Calipari’s call-in-show, Haotian Zhang asked him when he might see a countryman on the Big Blue team. The coach's response surprised him. LEXINGTON, Ky. (March 1, 2018) — Haotian Zhang’s love for the University of Kentucky’s men’s basketball team has offered him some exciting opportunities. This month, the senior had the chance to be a commentator at a National Collegiate Athletic Association game, University of Dayton Flyers versus the Virginia Commonwealth University Rams. Zhang was able to provide commentary in Mandarin, his native language, for the game’s Chinese viewers. Zhang is an international student from Nanjing, China, who chose to come to UK because he wanted to be a part of the culture that is UK basketball. He has been deemed a “superfan” and has been lucky enough to meet several of the basketball players throughout his four years at UK. He said as a freshman, his roommate happened to know several of the basketball players at the time, adding that he had the opportunity to cook Chinese food for Devin Booker. “For an international student, it’s very, very lucky,” Zhang said. His passion for UK basketball caught the attention of a friend from CBS Sports who offered him the commentator position at the Dayton Flyers game. Zhang said that it has always been a dream of his to be a commentator in Mandarin and his ultimate goal is to provide Mandarin commentary for a UK game in the future. 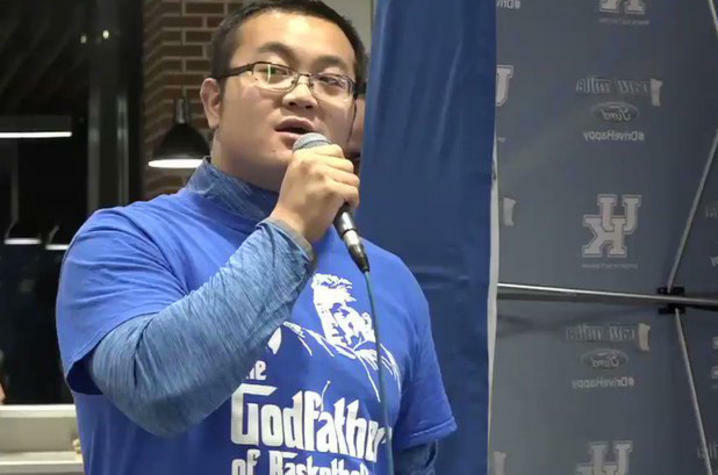 Zhang also recently had the opportunity to attend Coach John Calipari’s call-in-show at the new Champion’s Kitchen on campus. The "Paul Miller Ford John Calipari Show" event was open to all students, and they had the opportunity to ask the coach questions. Zhang asked Calipari when fans could expect one Chinese player on the basketball team. Calipari responded that a Chinese player would be a great opportunity for the university and the basketball program. “I would love it. Send me a Chinese player that can play. I’m all in,” Calipari said. Zhang believes that UK basketball would attain even greater popularity in China if there were more Chinese players, and that more Chinese students would be interested in attending UK as a result. Outside of school, Zhang travels as much as he can, both within the U.S. and internationally. Since his freshman year at UK, he has visited 40 states and eight countries, including Mexico, Cuba, Canada, Panama, Ethiopia, Egypt and Turkey, to meet with other international friends and to make new friends with the locals. It is fair to say that Zhang, after four years of being at UK, will be bleeding blue for years to come.